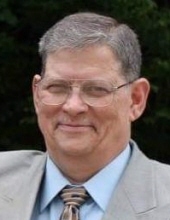 Roger Dale Gibson, age 61, of Viper, KY passed away on November 15, 2018 at the Hazard Medical Center. Roger was a retired parts manager at Faulkner's Garage for over 20 years and a Old Regular Baptist Minister for over 30 years. He was the son of the late Chester Gibson and the late Martha Lee Stacy Gibson. He is also preceded in death by two brothers: Willis & Chester Gibson Jr. and two sisters: Jewelene Centers and Sharon Kay Mullins. He is survived by his wife: Elizabeth Ann Mullins Gibson; one daughter: Chrystal Gail Holland (Kenneth Jr.) of Viper, KY; two sisters: Carolyn Beavers (Jack) of Nicholasville, KY & Georgina Howell of Leburn, KY; three brothers: Eddie Gibson of IN, Earl Gibson (Nadine) of Neon, Ky & Jeff Gibson (Beth) of Leburn, KY; special parents: Harlan & Betty Eldridge; brothers & sisters-in-law: Albert Mullins (Paula), Ella Faye Lawson, Harrison Mullins, Paul Mullins, Donna Campbell (Danny) & Sandy Ritchie (Matthew) and a host of nieces, nephews, family & friends. To send flowers or a remembrance gift to the family of Roger Dale Gibson, please visit our Tribute Store. "Email Address" would like to share the life celebration of Roger Dale Gibson. Click on the "link" to go to share a favorite memory or leave a condolence message for the family.